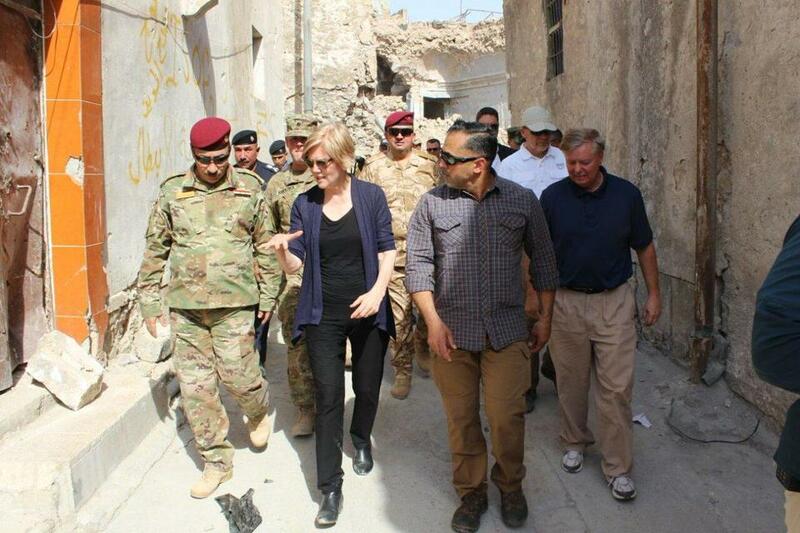 Amid continued speculation about a possible presidential run in 2020, Warren stopped in Kuwait for breakfast at Camp Arifjan with about 25 troops from a Reading-based unit of the Massachusetts Army National Guard, and then traveled to Iraq, where she joined Senator Lindsey Graham, the South Carolina Republican. The two senators toured a NATO operations center and visited a mosque in Mosul that was destroyed during fighting with the Islamic State. They also met with Iraqi Prime Minister Haidar al-Abadi. 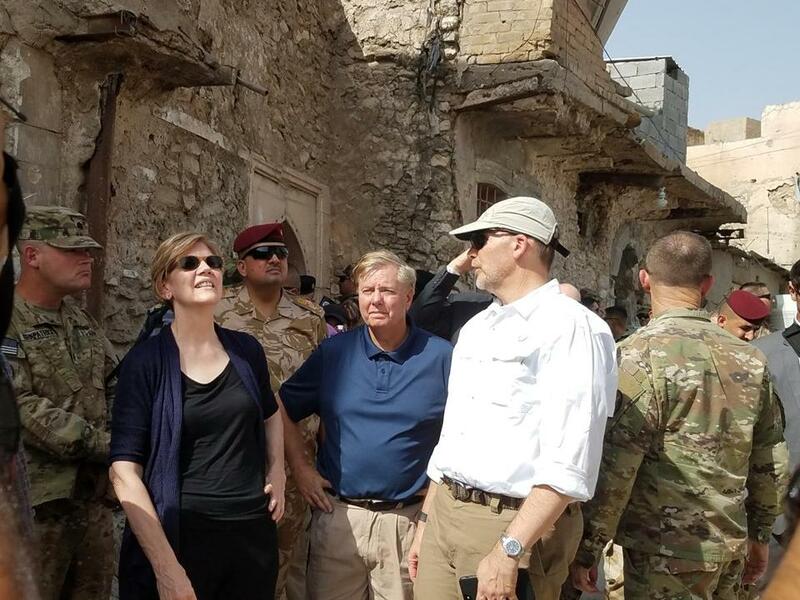 Warren capped off the brief trip Wednesday with a breakfast with foreign service officers from Massachusetts assigned to the US Embassy in Baghdad, briefings with military leadership, and a July Fourth celebration at the embassy. Graham, in a minute-long video posted to Twitter, thanked the troops, as well as President Trump, “for being a strong commander in chief.” He praised the effort in Iraq and noted how fewer US troops are dying as Iraq takes more responsibility. “It is important in my view that Iraq turn out well, that it not be a safe haven for terrorism or a satellite state of Iran,” Graham said in the video. For Warren, the trip is bound to raise further talk about her 2020 plans, as the Massachusetts Democrat and former Harvard Law professor continues trying to bolster her foreign policy credentials, which to date have been a weaker point in her resume. When asked, she says that she is running for the US Senate this year and not for president. This week’s trip is her latest holiday-time travel to a region that is vital to American foreign policy interests. Over Easter weekend, she visited the demilitarized zone between South Korea and North Korea on a trip that included stops in China, South Korea, and Japan. 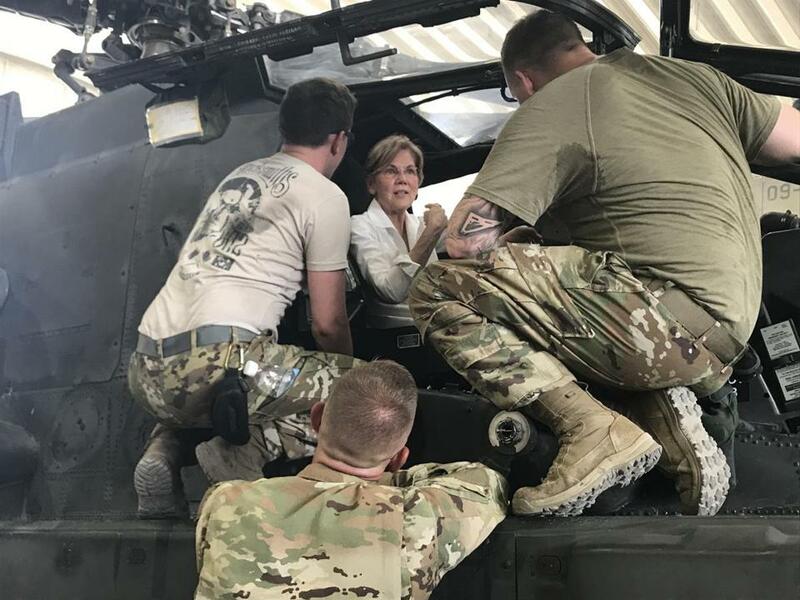 Last year during the Fourth of July, Warren went to Afghanistan to meet with troops and evaluate the rugged, war-torn terrain on a trip that was led by Republican Senator John McCain. Warren joined the Senate Committee on Armed Services last year, which was an early sign of her attempts to bolster her foreign policy chops, and the Globe reported last year that she had started holding a series of meetings with senior figures in the Democratic foreign policy and defense establishment. The committee perch also allows her to focus on protecting the defense industry in Massachusetts, such as Westover Air Reserve Base near Springfield and Hanscom Air Force Base in Bedford. But in contrast to her viral, made-for-YouTube moments on issues like banking and consumer protection, she has been more understated on defense and foreign policy issues. Her homework on the issues was showcased two weeks ago during a forum with Graham at the annual conference of the Center for a New American Security, a Washington-based national security think tank. She held her own against one of the Republican Party’s most experienced foreign policy voices. She argued for more funding for the State Department’s rank-and-file, pushed for broader military recruitment of researchers and troops from areas like New England, and spoke in defense of the Iran nuclear deal. She also criticized Trump for offering rhetorical support for North Korean leader Kim Jong Un without gaining any diplomatic concessions. But she also showed an inclination to turn the topics toward more familiar terrain: fighting for the American middle class. They also disagreed vigorously over America’s role in Afghanistan, with Graham arguing for a strong and indefinite military presence — and pushing Warren to articulate a plan rather than just criticizing the Trump administration — while Warren questioned whether the US military should have a role in solving Afghan political problems. “Well, what’s your plan?” Graham asked several times. The event was mostly cordial, with two senators debating vigorously but respectfully. “That’s very kind of you to say,” she responded.